This picture is from Thomson Nguyen, a 2006 member of Vanguard Cadets. 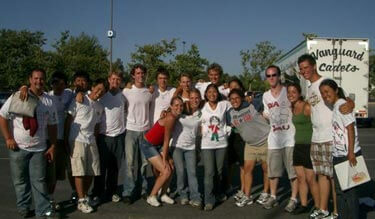 This photo was taken on Santa Clara Vanguard's Family Day (July 2, 2006), when Vanguard and Vanguard Cadets spent a day at Mission College to play our respective shows for each other, eat together and have a great time! This is a picture of both A-corps and Vanguard Cadets' pits combined after our truck loading race. It was down to the wire, but in the end we had to call a tie. It was down to the last second! I'm the person in the back, second from the left.